Employee training – it’s one of the top reasons organizations reach out to us. A business is looking to roll out training and they want a powerful platform that will help them achieve that. Getting a great learning management system (LMS) is a proactive first step. But it is just the first step. Next, you need to set up and start to deliver your training. Don’t worry – delivering employee training and development isn’t as difficult as you think. In fact, with the right tools, and a goal in mind, you can set up employee training pretty quickly. If you’re just starting your employee training journey or your business is looking to improve its current process, read on, this step by step guide has everything you need to know. Compulsory or not, introducing employee training and development can have powerful benefits for your organization. Now that we’ve covered the basics, let’s go through the steps and learning management system features that will help you deliver successful employee training. Employee training should be easy and fast to deliver. A good learning management system will do the hard work so you don’t have to! LMSs enable you to either upload your pre-existing training courses or to create new ones. You can create exams, quizzes, and surveys within the system so that you can assess learner performance and gather feedback. And your LMS should be SCORM and xAPI compliant (the standard eLearning course formats) so that all you have to do is drag and drop SCORM or xAPI packages into your LMS. Being able to add rich-media is a must too. The ability to add video, documents, and audio to your modules makes them much more engaging. For example, with LearnUpon, you can effortlessly upload your content and use a built-in text editor to embed code and insert media like YouTube videos directly into a course. This ensures a painless rollout process for your content. Next, you’re going to want to add your users to your LMS. You can do this manually by adding learners one by one, or in bulk through a CSV file. Or secondly and much more efficiently, you can do it automatically. You probably have an employee database like an HR system and with an integration, you can have an employee added to your LMS without extra work for you. When a user is added to your LMS, they get a notification via email inviting them to start their training. When training your employees, your LMS should easily allow you to conduct employee assessments, particularly for compliance training. You can create workflows that simplify assessment for compliance and other types of training. Additionally, setting up employee exam features can be used to check your employees understanding of their courses and reinforce the key takeaways. Or you can take it a step further by allowing your learners to upload their own assignments for you to assess. You can also collate invaluable feedback by setting up a survey. That way employees can share their thoughts and concerns about the courses and your workplace in general, enabling you to make improvements. A recertification feature allows you to re-enroll learners a specific number of days after they have completed a course. It’s incredibly useful if you have employee training that needs to be regularly completed to remain valid. You can set up automatic recertification based on a set number of days, reducing the amount of administration required. Then you can set it up to send an automatic recertification email to your learners telling them they’ve been re-enrolled for refresher training and the date they’ve to complete it by. Many companies have a requirement to deliver multiple types of training and to customize that training by areas like teams or job role. This is where groups come in. If you want to add more structure, scale, and organize your employee training, you can set up auto-assign rules that allow you to place users into specific groups based on certain criteria. As an admin, you set up the rules and then as users are added they’re automatically placed into their appropriate groups. After initial setup, it’s fully automated and your users gain access to their courses, unaware of the backend process. Gamification is a great way to increase your employees’ engagement with your courses. 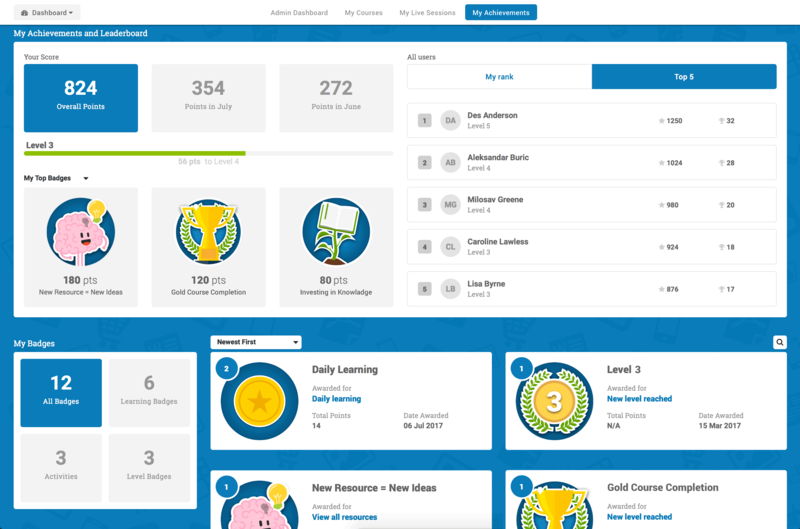 Achieved through points, badges, leaderboards, and levels, you can set it up so your learners are being rewarded for taking training, therefore motivating them to reach goals and complete their courses. It creates a little healthy competition in your company too! Need to train your learners on a series of courses? A learning path ties them together in a logical manner so that each learner follows the program of training you have designed. It’s a great way to plan out training programs that cover a larger topic, like employee onboarding, or are to be delivered over a longer period of time. Learners gain access to more advanced courses as they master the basics. Perhaps, the most essential part of delivering employee training with an LMS is the robust reports you can access. With any type of training, it’s important you know how it’s performing, how your learners are progressing and of course, how the training is impacting your business’s bottom line. Through your LMS you can get all this. Cleverly, you can set them up to be sent to anyone in your organization via email on a regular basis so that you and your team are always in the know. With planning and the right LMS features, you’ll be on the path to delivering effective employee training and development. Don’t forget though, you still need to rely on a supportive team. If you have a great LMS with a dedicated customer success rep and support team guiding you through your process, it’s an added bonus that is sure to boost your success rate.